Today in Masonic History we discuss the Regius Poem. The Regius Poem is believed to the oldest surviving masonic document. The Regius Poem is considered by Freemasonry to be one of the Old Charges. The Old Charges were meant to describe a members requirements when they joined an operative lodge. In order to join the operative lodge a new member would have to swear to the uphold and perform the things required in the charge. Often these would appear in the front of the lodge's book of minutes. The Regius Poem itself consists of 64 vellum pages written in a rhyming couplets. 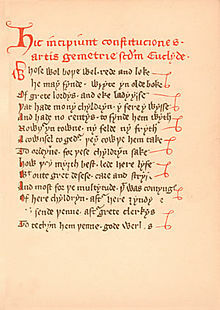 The poem starts with Euclid in ancient Egypt. It describes how Euclid "counterfeited geometry" and called it masonry. This was for the employment of the children of the nobility. After Euclid it describes how masonry is spread through 'many diverse lands'. It also documents how masons in England during the reign of King Æthelstan, the first King of England. In the poem as it relates to Æthelstan and Freemasonry, masons throughout England travel to Æthelstan's court and seek guidance on governing themselves. In this portion of the poem, Fifteen Articles and Fifteen Points. The articles in general have to do with the Master of the Lodge giving him moral directions on how to properly run his organization, both in the lodge and on the work site. There are things like how to treat the craftsman, who to allow into the lodge, and a statement to properly education the entered apprentice. The Points are generally directed at the craftsman of the lodge and follow a similar patter as the Articles. The Points also include recommended punishments for violating the Points. It also includes provisions for annual assemblies. The original Regius manuscripts origins are obscure. From the time that it is believed to have been written, somewhere around 1425, until the mid 1700's there are various records of individuals having it in their personal libraries. In 1757, King George II donated the manuscript to the British Museum. The document became the nucleus of the British Library. Prior to being donated, in 1734, it was cataloged and listed as a "Poem of Moral Duties." Because of this the poem was essentially 'lost' to Freemasonry for a time. In 1838, James Halliwell, who was not a mason, delivered a paper on "The Early History of Freemasonry in England." His work was largely based on the Regius Poem. In 1840 the paper was published, including the original Regius Poem. From that point on, it took on the new name of the "Halliwell Manuscript." At the time that Halliwell wrote his paper, the actual age of the Regius Poem was debated. Many at the time believed that dated to 1390. Edward August Bond who was the curator of manuscripts at the British Museum gave it a date of some 50 years later, putting it about 1440. He also stated that he believed that it was written by a priest. Modern dating techniques have confirmed that it does date to the some time between 1425 and 1450. It is also believed that it was written to counter a statute from 1425 which banned assemblies. The specific portion which calls for an annual assembly would counter the ban with some royal authority. The Original Poem ends with a blessing.